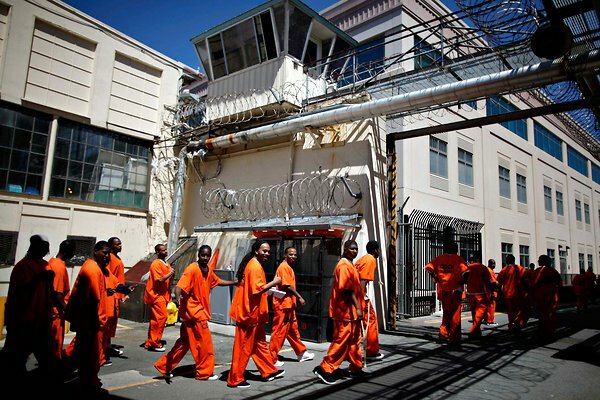 Inmates at the state prison in San Quentin, Calif., in June. I finally got a second to get a post up on here! I’ve been swamped, working on several upcoming projects, including the last video in the series of interviews with Felix Garcia by Jim Ridgeway and Pat Bliss, the PDF serialization of Felix’s story and an Idea Jim Ridgeway and I are hammering out together, which promises to be really exciting. I saw this story in the New York Times about a week ago. The author postulates that since prisoners aren’t counted by sociologists and statisticians when formulating the upward mobility and social status of ethnic groups – and that since almost 50% of U.S. inmates are Black – that Post Civil Rights Era Blacks are not doing as well as we may want to believe. [C]orrections officials count actual prisoners, a captive audience; sociologists and census-takers typically undercount prisoners and former inmates living on the edge of society. The real problem, as Dr. Pettit sees it, is that imprisoned black men aren’t figured into statistics about the standing of African-Americans. The consequence, she says, is an overstatement of black progress in education, employment, wages and voting participation. In short, any social or ethnic group can be made to appear successful in statistics, if their prison population isn’t counted in the equation. When that population is re-added back into the mix, that particular group doesn’t fare so well. ¶ Black dropouts are more likely to spend at least a year in prison than to get married. These figures are truly disheartening. We have written a lot on the School to Prison Pipeline, the inequity of Black inmates and the prevalence of Prison Gerrymandering, and these statistics clearly back up what we’ve been saying. America is the world’s #1 jailer. Individual cities as well as private corporations have developed whole economies around the incarceration of Human beings. States like California and Florida are actually to the point where they can no longer afford to warehouse the massive numbers of people in their jails and prisons. Questionably unconstitutional laws like mandatory sentencing and Three Strikes laws are forcing the Justice system into a similar situation to what happened in the Mental Health system in the 1980s – where it became so costly that President Reagan had no choice but to simply close them all down and turn the patients out in the streets. But what stands out in this article, is that sociologists, the Census and other civil statisticians are using this immense prison population to jury-rig the numbers so as to make those of us who are fortunate enough to not be locked up, look like we’re doing better than we really are. Posted in ReBlogs.Tagged #JusticeForFelix, BitcoDavid, Black Inmates, Crime and Justice, Deaf in Prison, DeafInPrison.com, Mental health, New York Times, School to Prison Pipeline, U.S. Prisons. Reblogged this on Nightlight1220's Blog.